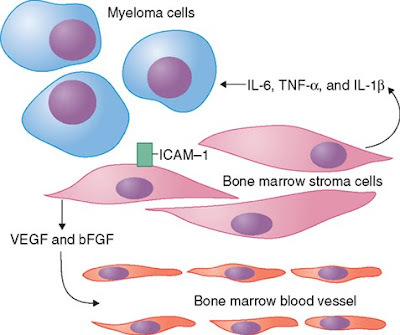 In this blog you are going to gain various types on Myeloma Cancer information. We first with Multiple Myeloma Cancer, and what is Myeloma Cancer is? Myeloma also known as multiple myeloma cancer is a cancer that originates in the plasma cells of the human body. Plasma cells like the blood cells are responsible for some functions. When they start behaving abnormally and start reproducing with improper discharge of the old and dead cells, it could lead to an accumulation of these cells to form a tumor. The condition is grave and is more common amongst men than in women. It also occurs in people who are mostly above the age of 65 years. Myeloma cancer attacks the bones of one’s body, it is characterized by a pain in the bones of the back to start off with. Doctors have been unable to pin down the exact reason for one suffering from this type of cancer. However certain risk factors like diet and hereditary reasons could give rise to the condition as well. There are four stages in myeloma cancer. The early stage is also known as the smoldering stage. Then follows stage one, two and three. In most cases there are no symptoms during the smoldering stage, the cancer is usually detected through a biopsy. When the cancer is detected the doctor will check the stage it is at and prescribe a mode of treatment for the same. There are a number of methods to treat the cancer. Watchful waiting, is usually prescribed in the smoldering stage when there are no symptoms and the cancer has not spread. This method requires the patient to wait and undergo regular check-ups, once in every three months to check the spread of the disease. The other methods include radiation therapy, stem transplant and induction therapy. It is important that your doctor understands which stage you are at and prescribes a treatment that is appropriate. Also, people who suffer from multiple myeloma are very prone to infections, and hence proper care is necessary to ensure that pain is kept to the bare minimum. Cancer treatment usually has a number of side effects and a lot of care is required for the patient. After the treatment is over, it is important that patients go for regular check-ups to ensure that the cancer cells have been wiped out. Often all the cells may not have been treated and may start multiplying without your knowledge. Your doctor will conduct tests on a regular basis to ensure that the treatment takes care of the cells that are still present in your body. Multiple myeloma cancer can be a very painful and stressful condition. Hence it is necessary that it is detected in the early stages itself. If it is at the smoldering stage, cancer treatment can be delayed to avoid side effects for as long as the symptoms start showing. While watchful waiting helps you stay away from the pain of cancer treatment, it may spread the disease further if not checked on a regular basis for the development of the cancer. Make sure that you only trust an expert if you suspect that you may be suffering from myeloma cancer.